Sep 6, 2018 - Marine & Coastal Policy Research Unit, University of Plymouth ... and management through TECF since. 1990s ... Strategic goals to raise city profile, civic pride and self-esteem ... >100 new businesses +4,000 jobs in 5 yrs. the Brunswick River mouth, with its seaward boundary being defined by the ...... of compatible classifications such as those already developed in Victoria and. HIWWT â Hampshire and Isle of Wight Wildlife Trust. HOCI â Habitat of Conservation ...... 1987 OPRU HRE Newtown and Bembridge Harbours survey. Yes. Yes. decisão, numa tentativa de alcançar uma estratégia de conservação dos ecossistemas. Uma das questões mais frequentemente utilizadas pelos naturalistas. Social unit, clan or lineage, subdivision of a Yavusa clan ...... WCS currently bears the cost of the long-term biological monitoring to ..... along the Bat Cave. Editorial. 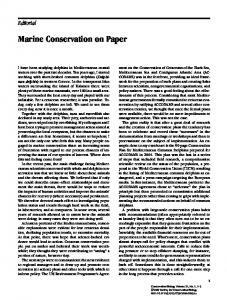 Marine Conservation on Paper. I have been studying dolphins in Mediterranean coastal waters over the past two decades. Ten years ago, I started . Centre, Nusa Tenggara Barat. The park is a ... more details see Myers & Bishop (2005) and Sykes. & Sykes ... the trails (Plate 6), calling to each other at night. New challenges to sustainable productions emerging include agri-chemicals appearing in water bodies. .... South Wales for over 25 years (Wiltshire, 1948), there have not been any similar ..... Sallaway, M.M., Lawson, D. and Yule, D.F., 1988. Zealand exhibits a striking parallelism to the record of air ... Southwest Pacific: Similarities with Antarctica and ENSO .... Arrow and dashed line mark the UK0. Echeneis naucrates was recorded both on the coast and on oceanic islands, .... AA= Abrolhos Archipelago, NE Brazil; AC= Arraial do Cabo, SE Brazil; FN=. ABSTRACT CASTRO, J. J. and CRUZ, T., 2009. Marine conservation in a SW Portuguese natural park. Journal of Coastal Research, SI 56 (Proceedings of the 10th International Coastal Symposium), 385 – 389. Lisbon, Portugal, ISSN 0749-0258 Most of the SW Portuguese continental coast is protected by a natural park (Parque Natural do Sudoeste Alentejano e Costa Vicentina – PNSACV). A marine zone 2 km wide has been designated along the coast of this park (ca. 130 km) with oceanic sandy beaches, extensive rocky shores, and small estuaries and coastal lagoons. In this coast, intensive and traditional fisheries affect several target species for subsistence, commercial use or recreation. Most regulations are national and almost no specific regulations are in place to allow sustainable exploitation. Control and enforcement are generally insufficient or ineffective and the decrease of catches and the increase of fishing effort are apparent. In order that these resources and habitats can be exploited sustainably, there is an urgent need for taking management and conservation measures, like the effective use and update of existing regulations and the designation of marine protected areas. The restoration of exploited populations in marine reserves is one of several potential benefits of this protection, as well as the export of fish biomass to adjoining areas and the improvement of conservation, education, science, tourism and recreation. The existing marine protection of this natural park is an opportunity for taking such management and conservation measures, in an adaptive and integrated process that should allow co-responsibility of users and managers. We present a review of estimates of intensity and yield of fisheries, data on users perception of management and conservation needs, and proposals for the implementation of a marine conservation programme in PNSACV through the designation and management of marine protected areas. ADITIONAL INDEX WORDS: Fisheries intensity and yield, Fishermen perception, Co-management, Marine protected areas. increase in severity worldwide and continue to cause major impacts on marine communities (THOMPSON et al., 2002). Tourism, agriculture and fisheries are the main economic activities in this natural park. In order that the marine resources and habitats can be exploited sustainably, there is an urgent need for taking management and conservation measures. The existing marine protection of this natural park is an opportunity for taking such measures, but in an adaptive and integrated process that should allow co-responsibility of users and managers. We present a review of estimates of intensity and yield of fisheries published elsewhere (e.g. 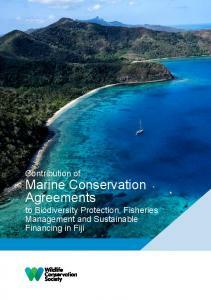 CASTRO, 2004; DGPA, 2008), unpublished data on fisheries and on users perception of management and conservation needs, and proposals for the implementation of a marine conservation programme in PNSACV through the designation and management of marine protected areas (MPAs). all these ports was 22843 tons, although only 248.4 tons were landed at those small fishing ports (fresh weight; DGPA, 2008). However, these fisheries data refer to a much greater region than marine PNSACV and the real catch and effort made by commercial fisheries in this park are not known. algae Gelidium sesquipedale, the common seabream Pagrus pagrus, the common pandora Pagellus erythrinus and the common two-banded seabream Diplodus vulgaris) and a stock overexploited (the seabass Dicentrarchus labrax). On rocky shores of Alentejo, the exploitation rate of the purple sea urchin Paracentrotus lividus was not considered to be a risk for its conservation and the stock of the china limpet Patella ulyssiponensis was considered to be moderately fished, but the stock of the stalked barnacle P. pollicipes was considered to be highly to fully fished (CASTRO, 2004). Considering recreational (on rocky shores) and commercial fisheries, CASTRO (2004) estimated a total annual yield of 5.9 tons per km2 in the coast of Alentejo. On open continental shelves with upwelling-type circulation of medium latitudes (the case of continental Portuguese coast, but see FIÚZA et al., 1982), BAX and LAEVASTU (1990) considered that an annual yield of 4.5 to 8 tons per km2 of an intensive fishery is sustainable. Perception From 2005 to 2008, direct inquiries were made in the coast of Alentejo to know the opinion of rocky shore fishermen (shellfish collectors and anglers) on their fishing activity and on management and conservation issues related with this activity (J. J. CASTRO, unpublished data). A total of 362 fishermen (192 shellfish collectors and 170 anglers) were interviewed during their fishing activity or just before they left the shore. Eight rocky shores were sampled in Sines municipality (Figure 1), six of them in northern PNSACV. Most fishermen (76.4%, N=360) considered that catches have been decreasing since they begun this activity (58% do it for more than 20 years). However, most (65.3%, N=340) did not agree that rocky shore fishing negatively affects the yield of this activity, and the majority (78.2 and 72.4%, respectively; N=340) blame it on pollution and trawling. Almost all (98.3%, N=361) answered that the fish or shellfish taken was going to be eaten by themselves or by their family or friends. Only 3% (N=361) told that they were going to sell some part of their catch. Most fishermen (71.2%, N=361) told they were fishing for recreation, 37.4% were fishing because this activity is important to get food for them, for their family or friends (11.1% chosen both options), and only 3.3% considered that this fishing activity is important to their own economy or their family’s. Regarding marine resources conservation and fisheries management, the majority (78.2%, N=362) agreed that measures are necessary to be taken on rocky shores of Alentejo. Most popular measures were (N=288): minimum size/weight of preys (75.7%), one annual closed season (73.3%), more and better control (65.6%) and continuous no-take marine reserves in some areas (63.9%). In 2008, commercial fishermen were interviewed in the ports of Sines and Porto Covo (Sines municipality; Figure 1; J. J. CASTRO, unpublished data). Regarding marine resources conservation and fisheries management, the majority (87.5%, N=48) agreed that new measures are necessary to be taken on the coast of Alentejo. Most popular measures were (N=42): one annual closed season (88.1%), co-management of certain areas (57.5%, N=40), rotation of fisheries closures in space and time (45.2%) and continuous notake marine reserves in some areas (45.2%). (see review by PALUMBI, 2001) consider that 20% protection may represent a minimum level at which MPAs provide both diversity and fisheries benefits. However, this amount is clearly not enough to provide optimal fishery benefits in most cases and several authors proposed values higher than 35% (BOTSFORD et al., 2001, 2003; ROBERTS et al., 2006). Considering IUCN categories of protected areas, CASTRO (1996) proposed (see Figure 1) the designation of two Natural Monuments on two groups of small islands (“Ilha do Pessegueiro” and “Ilhotes do Martinhal”), three Protected Seascapes on low use areas (“Nascedios”, “Cabo Sardão” and “Carvalhal/Castelo Velho”), two Habitat/Species Management Areas on medium use areas (“Torre de Aspa” and “Telheiro”) and two Managed Resource Protected Areas on high use areas (“Monte Clérigo/Arrifana” and “Pontal da Carrapateira”). Using the simplified taxonomy of MPAs proposed by PALUMBI (2001), the first two MPAs above mentioned are mainly focused on ecosystem diversity, requiring local effects to be visible within the boundaries of the reserve; the others are focused on fisheries (fisheries reserves), requiring export of a reserve effect from the boundaries of the MPA to the adjoining region. However, the two MPAs mainly focused on ecosystem diversity should be no-take zones and will also tend to export biomass, and the fisheries reserves should have core (no-take zone, in the centre) and buffer (co-managed fishing zones, northwards and southwards) zones in order to provide both ecological and economic benefits. In all MPAs, visitation should be allowed in order to raise public awareness on the effects of protection and for the improvement of non disturbing touristic (e.g. nature tourism, scuba diving), educational, scientific and recreational activities. On the fisheries reserves, fishing should be subjected to regular biological planning and monitoring and restricted to the less disturbing and more selective activities and fishing gears (traps or longlines). With the goal of achieving sustainability, the fishing effort should be defined and controlled by the natural park, the fisheries authorities/agencies and organisations of fishermen through co-management. Priority should be given to local organisations of professional fishermen, in order that comanagement is feasible and economic benefits of protection help meet community needs. Co-management through territorial user rights for fishing (TURFs; CASTILLA, 2000) should be implemented in the case of stalked barnacle P. pollicipes fisheries, adapting the system used since 1992 in Galicia, NW Spain (MOLARES and FREIRE, 2003). This measure should be taken in zones of marine PNSACV important for Pollicipes fishing, namely in co-managed fishing zones of future MPAs, where recreational fishing of this barnacle should be avoided. TURFs and individual quotas (transferable or non-transferable; CASTILLA, 2000) should also be implemented to co-manage other commercial fisheries in marine PNSACV, namely in fishing zones of future MPAs, incorporating fishermen as active role-players in the processes of management. improvement of conservation, education, science, tourism and recreation. The existing marine protection of this natural park is an opportunity for taking such management and conservation measures, in an adaptive and integrated process that should allow co-responsibility of users and managers. LITERATURE CITED ANDERSSON, A.; CHAMPION, A.; CHRISTIANSEN, S.; LINDSTROMBATTLE, J. and SCHMIDT, S., 2003. Do governments protect the treasures of our seas? Measuring progress on marine protected areas. WWF Germany, 89p. ATTWOOD, C.G. ; HARRIS, J.M. and WILLIAMS, A.J., 1997. International experience of marine protected areas and their relevance to South Africa. South Africa Journal of Marine Science, 18, 311-332. BAX, N.J. and LAEVASTU, T., 1990. Biomass potential of large marine ecosystems: a systems approach. In: SHERMAN, K.; ALEXANDER, L.M and GOLD, B.D. (eds.) Large marine ecosystems: patterns, processes and yields. American Association for the Advancement of Science, pp. 188-205. BOTSFORD, L.W. ; HASTINGS, A. and GAINES, S.D., 2001. Dependence of sustainability on the configuration of marine reserves and larval dispersal distance. Ecology Letters, 4, 144150. BOTSFORD, L.W. ; MICHELI, F. and HASTINGS, A., 2003. Principles for the design of marine reserves. Ecological Applications, 13(1) Supplement, S25-S31. CANÁRIO, A.V.M. ; ERZINI, K.; CASTRO, M.; GONÇALVES, J.M.S; GALHARDO, C.; RIBEIRO, J.; BENTES, L.; CRUZ, J. and SOUTO, P., 1994. Estudos base para a conservação dos ictiopovoamentos e gestão da pesca costeira no litoral sudoeste. Relatório final. Unidade de Ciências e Tecnologias dos Recursos Aquáticos, Universidade do Algarve, 219p. CASTILLA, J.C., 2000. Roles of experimental marine ecology in coastal management and conservation. Journal of Experimental Marine Biology and Ecology, 250, 3-21. CASTILLA, J.C. and DEFEO, O., 2001. Latin American benthic shellfisheries: emphasis on co-management and experimental practices. Reviews in Fish Biology and Fisheries, 11, 1-30. CASTRO, J.J., 1996. Selecção e gestão de áreas marinhas protegidas no Parque Natural do Sudoeste Alentejano e Costa Vicentina. Laboratório de Ciências do Mar, Pólo de Sines, Universidade de Évora, 204p. CASTRO, J.J., 2004. Predação humana no litoral rochoso alentejano: caracterização, impacte ecológico e conservação. Universidade de Évora, Ph.D. thesis, 348 p. CASTRO, J.J., CRUZ, T. and HAWKINS, S. J., 2000. Exploração e conservação de recursos vivos da costa alentejana. In: CARVALHO, G.S. ; GOMES, F.V and PINTO, F.T. (eds.) A zona costeira do Alentejo. Associação Eurocoast-Portugal, pp. 143157. COCKROFT, A.C.; SAUER, W.H.H. ; BRANCH, G.M. ; CLARK, B.M. ; DYE, A.H. and RUSSELL, E., 2002. Assessment of resource availability and suitability for subsistence fishers in South Africa, with a review of resource management procedures. South Africa Journal of Marine Science, 24, 489-501. CROWE, T.P., THOMPSON, R.C., BRAY, S. and HAWKINS, S.J., 2000. Impacts of anthropogenic stress on rocky intertidal communities. Journal of Aquatic Ecosystem Stress and Recovery, 7, 273-297. CRUZ, T., 2000. Biologia e ecologia do percebe, Pollicipes pollicipes (Gmelin, 1790), no litoral sudoeste português. Universidade de Évora, Ph.D. thesis, 306p. DGPA (Direcção-Geral das Pescas e Aquicultura), 2008. Recursos da pesca. DGPA, Série Estatística, Volume 21 A-B, Ano 2007, 181p. DYE, A.H., Branch, G.M., Castilla, J.C. and Bennett, B.A., 1994. Biological options for the management of the exploitation of intertidal and subtidal resources. In: SIEGFRIED, W.R. (ed.) Rocky shores. Exploitation in Chile and South Africa. Springer-Verlag, pp. 131-154. FERRAZ, R.R. ; MENEZES, G.M. and SANTOS, R.S., 2001. Limpet (Patella spp.) (Mollusca: Gastropoda) exploitation in the Azores, during the period 1993-1998. Arquipélago, Life and Marine Sciences, Supplement 2 (Part B), 59-65. FIÚZA, A.F.G. ; MACEDO, M. E. and GUERREIRO, M.R., 1982. Climatological space and time variation of the Portuguese coastal upwelling. Oceanologica Acta, 5, 31-40. GUBBAY, S. (ed. ), 1995. Marine protected areas. Principles and techniques for management. Chapman & Hall, 232p. HOCKEY, P.A.R., 1994. Man as a component of the littoral predator spectrum: a conceptual overview. In: SIEGFRIED, W.R. (ed.) Rocky shores. Exploitation in Chile and South Africa. Springer-Verlag, pp. 17-31. JESUS, D., 2003. Gestão do percebe (Pollicipes pollicipes (Gmelin, 1790)) no Parque Natural do Sudoeste Alentejano e Costa Vicentina. Universidade do Algarve, Master's thesis, 121p. KELLEHER, G., 1999. 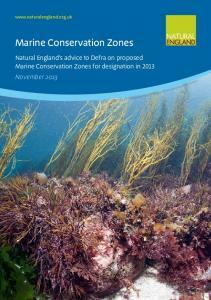 Guidelines for marine protected areas. IUCN, 107p. KELLEHER, G.; BLEAKLEY, C. and WELLS, S., 1995. A global representative system of marine protected areas. Volume 1. Great Barrier Reef Marine Park Authority, The World Bank and The World Conservation Union, 219p. MOLARES, J. and FREIRE, J., 2003. Development and perspectives for community-based management of goose barnacle (Pollicipes pollicipes) fisheries in Galicia (NW Spain). Fisheries Research, 65, 485-492. MORENO, C.A., 2001. Community patterns generated by human harvesting on Chilean shores: a review. Aquatic Conservation: Marine and Freshwater Ecosystems, 11, 19-30. ODENDAAL, F.J.,; BERGH, M.O. and BRANCH, G.M., 1994. Socioeconomic options for the management of the exploitation of intertidal and subtidal resources. In: SIEGFRIED, W.R. (ed.) Rocky shores. Exploitation in Chile and South Africa. Springer-Verlag, pp. 155-167. PALUMBI, S.R., 2001. The ecology of marine protected areas. In: BERTNESS, M.D. ; GAINES, S.D. and HAY, M.E. (eds.) Marine community ecology. Sinauer Associates, Inc., pp. 509-530. ROBERTS, C.M. ; MASON, L. and HAWKINS, J.P., 2006. Roadmap to recovery: a global network of marine reserves. Greenpeace, 57p. SALM, R.V. ; CLARK, J.R. and SIIRILA, E., 2000. 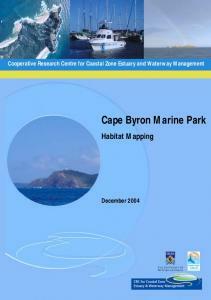 Marine and coastal protected areas: a guide for planners and managers. IUCN, 371p. SANTOS, R.; CRISTO, C. and JESUS, D., 2003. Stock assessment of the agarophyte Gelidium sesquipedale using harvest effort statistics. In: CHAPMAN, A.R. ; ANDERSON, R.J.; VREELAND, V.J. and DAVISON, R. (eds.) Proceedings of the International Seaweed Symposium, Cape Town, 2001. Oxford University Press, pp. 145-150. SANTOS, R.S. ; HAWKINS, S.J. ; MONTEIRO, L.R. ; ALVES, M. and ISIDRO, E.J., 1995. Marine research, resources and conservation in the Azores. Aquatic Conservation: Marine and Freshwater Ecosystems, 5, 311-354. SIEGFRIED, W.R. (ed. ), 1994. Rocky shores: exploitation in Chile and South Africa. Springer-Verlag, 177p. SILVA, T.; CLARK, R. and CASTRO, J.J., 1998. Exploração de Charonia lampas (Mollusca: Gastropoda) na costa alentejana. X Simpósio Ibérico de Estudos de Bentos Marinho, poster. THOMPSON, R.C., CROWE, T.P. and HAWKINS, S.J., 2002. Rocky intertidal communities: past environmental changes, present status and predictions for the next 25 years. Environmental Conservation, 29(2), 168-191. UNDERWOOD, A.J., 1993. Exploitation of species on the rocky coast of New South Wales (Australia) and options for its management. Ocean & Coastal Management, 20, 41-62. WELLS, S. and WHITE, A.T., 1995. Involving the community. In: GUBBAY, S. (ed.) Marine protected areas. Principles and techniques for management. Chapman & Hall, pp. 61-84. ACKNOWLEDGEMENTS We are indebted to Prof. Stephen J. Hawkins (Bangor University, UK) for advising help, and to numerous students who helped inquiring fishermen. Report "Marine Conservation in a Southwest Portuguese Natural Park - e-Geo"